I paused, leaned down and placed my hand softly atop the dry magma covered trail. I could feel the heat of the earth beneath my hand, a stark contrast to the cold wind that blew my hair back and motivated me to zip up my vest. I scooped up Cabu, our newest adventure partner, inspecting his paws before placing him on my shoulder. He wrapped himself around my neck, leaning slightly into the top of my backpack. I turned into the wind and continued up the trail. As I reached the closing of the lava tunnel we had been hiking along, I followed the dusty path up to the top of the ridge, heading straight into the strong wind waiting at the top. Cabu meowed in my ear, his kitten cries making me smile as he ducked back down into the backpack to escape the wind. He was already proving to be a great adventure companion. We hiked along for another mile or so, drinking deeply the incredibly vast views of the mountain valleys filled with forests, lakes and volcanoes of southern Chile. I noticed that some of the leaves on certain trees were beginning to change color already, and although the heat of the previous day felt as though we were still in the full embrace of summer, today had many hues of fall. We continued along the trail, wrapping around the mountainside until Volcan Villarica sat directly in front of us, its top hidden beneath the thick cloud cover above. The volcano had recently increased in activity, a bubbling lava pool forming at the top of the crater only a week or so before. Being so close to it now I could feel a different kind of energy. Every few minutes a distinct booming sound came from the direction of the volcano. It was exciting, but also a bit unsettling; like hearing an avalanche canon and knowing you are in a place wild enough to warrant the use of that canon, but also the reality of how dangerous an avalanche could be. This piece of earth was alive. It was breathing, hiccuping, gurgling…and all we could do was guess what it was really up to. I put Cabu on the ground and he trotted along beside me, happy to be able to inspect the ants and wild blueberry bushes lining the otherwise dry, bare trail. Suddenly the wind shifted and a dark set of clouds began to blow toward us. It seemed like a good time as any to turn back, so we looped around and picked up the pace a bit, the wind now at our backs, pushing us forward, away from the dark clouds above, away from the grumbling volcano behind. The following day we hear stories from those in town who saw lava spurting from the top of the volcano the evening before. Neighbors enjoying the light show from afar, friends of friends planning to hike into El Cerduo that night and climb to get the perfect photograph. The activity was increasing each day, and the alert had been raised from yellow to orange. That booming I had heard up in the mountains, that was the volcano after all. It all seemed a bit surreal, this little town at the base of a volcano, people going about their normal daily activities, meanwhile the massive 9000 Ft. volcano towering above us is speaking up. It’s Monday, and we’re all just going about our lives as usual. But this was not just another usual Monday for our volcano. We decide that tonight we will see the lava bubbling and jumping from the top of the volcano. Once it’s dark, we’ll drive up the back road behind the house that wraps around the mountain ridge just on the flanks of the volcano. We’ll be far enough away to watch from a safe distance, but close enough to get a killer show. The clouds are heavy as we drive home from work, our chances of seeing anything seem slim to none; but still, we hope. Darkness settles in and we pile into the car, bundled up against the cool air, a bottle of wine thrown in to keep us warm up top. Cabu meows at first but quickly settles in as the bumpy ride ensues. The drive up is rough and we carefully navigate the deep ditches and drop offs where the road has washed away. The wind has blown most of the clouds away and the nearly full moon shines brightly above us. Stars begin to light every corner of the space above, like fireflies waking up on an early July evening. 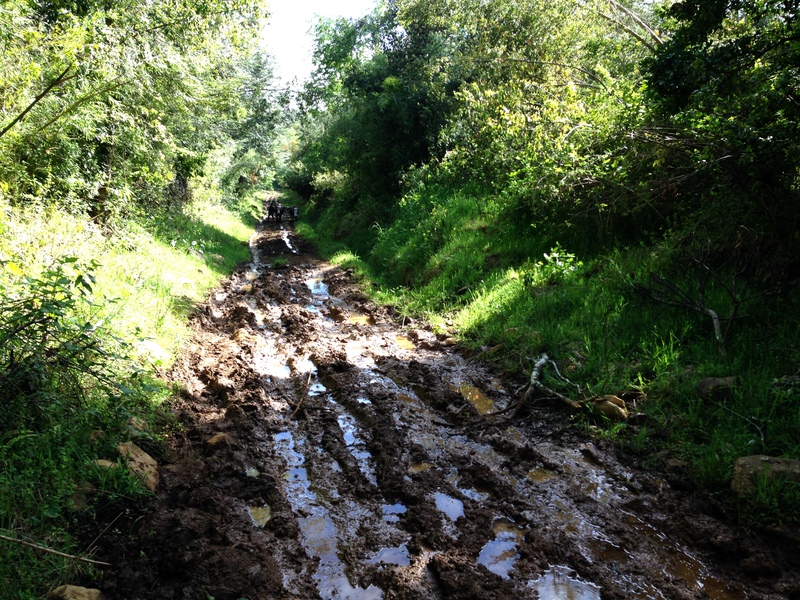 We park our trusty Super Burro when the road begins looking more like a drainage ditch than a manageable path. It’s time to hike. The night is quiet, we marvel at the stars, the brightness of the moon, and the distinct booming we again hear in the distance. Up we go, finally arriving at a clearing where we sit down on massive fallen Coihue tree trunks, pass the bottle of wine and watch the clouds atop the volcano glow various hues of red. The sight is wild, unlike anything I have ever witnessed. We let out small cheers when we see bits of lava spurt up above the clouds, burning a bright red orange. The volcano has a pulse. The red glow disappears, fades fully into the clouds as though it was never there, and then suddenly returns with a crescendo of lava bursting out. It is all quite calm though, the soft moon watching over us, the warm light of the lava filling in the color of the clouds. We laugh and tell stories, marvel at the fact that none of us ever expected to experience something like this in our lives. And yet here we all were, seeing this incredible, rare sight. We finish our wine and turn as the volcano seems to go quiet. It was a lovely show and we were pleased with our little front row seats. As we walk down to Super Burro we meet Don Jose, one of our neighbors whose house overlooks the volcano. He greets us warmly and tells us how the volcano has been acting up even more around 1am or so. Ale asks if he has a car to escape if he needs to, he says no. He stands tall, wearing a hardhat. They exchange phone numbers, in case anything happens on this mountain we share. We say goodnight and wave goodbye. He stands by his gate, the outline of his hardhat is black against the bright moonlight backdrop. A roaring noise outside wakes me abruptly from my dream. Ale’s phone begins to ring and he doesn’t even have to answer it, we just know the volcano is erupting. Don Jose is calling, I can hear his voice through the line- it is happening, it is really going now! It is dangerous up where he is now. As Ale asks if he is okay and if he needs anything, I make my way out to the deck to listen closer to the roaring noise in the sky. The sound is overwhelming; it is as though we are standing beside a waterfall, yet the tone is somehow more hollow than falling water, like a blowtorch and a fire hose firing together. I struggle to describe it, but it vibrates with energy, with mass, with vastness beyond anything a human has the ability to grasp. As I look around the side of the house I see a huge tower of red glowing behind the trees, reaching far up into the sky and exploding into a massive plume of dark black smoke and ash that seems to have a life of its own. It’s 3am. I run outside and wake up Christina and Pete in the cabin. From the tent cabin in the woods Ellie calls out “what’s happening Greta”? “The volcano is erupting!” We all hike up the driveway together and just a few feet from the house we can see the lava shooting high into the sky, a powerful column of red reaching more than 3000 feet above the top of the volcano. We all gasp. The plume of smoke above it is absolutely massive, swirling like the genie in Aladin, dark black against the now clear, deep blue night sky. It looks ominous. The calmness of our earlier viewing is gone, the energy is entirely different, the power is beyond measure. As we walk up the road a little further, we are startled to see the black cloud light up with lightening. It is incredible. I am absolutely awestruck by the hugeness of it all, by the colors the sounds, the feeling of the energy in the air and the shapes of the natural wonder happening before us. We watch as the tower of lava drops back into the volcano, spilling over the sides, oozing down the cone of the crater, creating long lines of red veins that grasp hold of the volcano’s surface, deforming its face, changing its character, molding its shape and reforming its skin. Eventually, the roaring noise softens slightly and the huge plume of smoke floats above, disconnected from the lava tower and slowly blends back into the sky, taking with it the lightening strikes and blackness that was darker than the night itself. It is nearly 5am when my head falls back onto the pillow. Around 5:30am I am awoken again by the roaring sound in the sky. As I open my eyes I realize I was dreaming of a huge wave of black flowing lava was coming straight at us, just short of reaching the house before I grasped reality again. 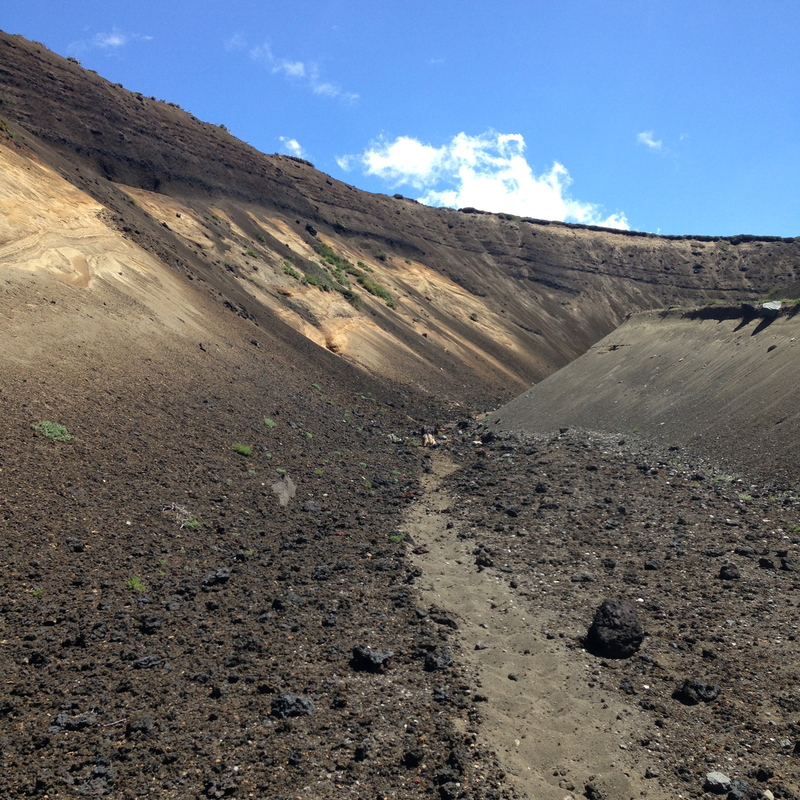 We were on a mountain that sat across a deep valley, and although perhaps 8 KM from the volcano, the possibility of lava coming anywhere near us was pretty slim. Yet the mind will do what it wants with what we are exposed to. Mine chose to toy with the scenario of a black magma escape. As sunlight poured into the bedroom, Tuesday morning arrived seeming like any old Tuesday. It of course wasn’t any old Tuesday, the volcano had erupted only hours earlier. 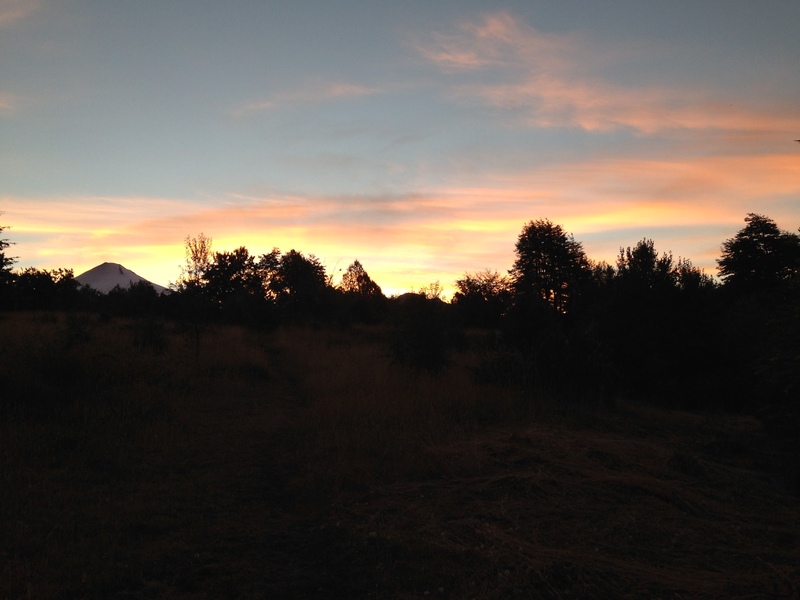 I brewed coffee and Ellie and I hiked up the road to see if Villarica was still acting up. As we rounded the curve of the driveway and the view opened up the volcano sat quietly in front of us, silent and stark, not even a whisper of smoke coming from its center. The sky was a clear bright blue. The sun shone warmly. Birds flittered about among the trees, chirping happily. The roaring sky, the ominous black cloud, the towering column of flying lava, the chaotic energy of the air, it was all gone; it could have all been a dream. The only clue that anything had occurred under the cover of darkness was the marked difference in the shape and look of the volcano. Somehow the top looked different, and where once was snow was now blackened with soot and long lines of hardened charred lava. We drank our coffee. We marveled at the experience, at the sheer wildness of the eruption, and the stark normalcy of life that ensued after it. Nature had taken its course, and moved on. Life goes on. It seemed to be just another Tuesday for our volcano. It wasn’t just another Tuesday for the rest of us here in Pucon. Thousands of people were evacuated last night as a precaution, roads were closed, military was brought in. The president of Chile walked our streets and shook our hands. Businesses remained closed and although some people returned home, others have taken the time only to gather what they need and get out. In the daylight the volcano sits quietly. But we are told that its not finished yet. When the lava tower collapsed last night it apparently dropped back into the crater, forming a clot of sorts. A temporary clot. The pressure is building, so precautions must continue. As the sun sinks lower, as the afternoon melts into evening, we now wait to see if Villarica has more to say. If we have yet to see all its might, if we will again bear witness to the remarkable eruption of the inside of our earth spewing out onto its surface. We have gallons of water we’ve bottled and set aside, we have batteries, we have food, we have masks. Electronics are charged and animals are fed. We have the company of one another, stories to be told and laughter to let loose. So here we are in southern Chile, having one of those remarkable experiences in life that cannot be planned, that cannot be orchestrated, that unfolds exactly as nature intends, regardless of what we think we can control. With all that said, with all these words, we’ll see you on the other side of another night with a nearly full moon, a sky full of stars, and an erupting volcano. Villarica sits quietly behind the property where we live, resting in the evening light. I couldn’t help but laugh at the irony of this advertisement plastered to the walls of the MTR station in Hong Kong as I wore my own face mask preparing to battle the pollution lurking in the streets above. I suddenly awoke from a fretful sleep, sitting upright quickly, trying to breathe deeply in between aggressive coughs. I simply couldn’t catch my breath, with each inhale the irritation in my lungs grew and my coughing multiplied. My mind raced to the PSA about Tuberculosis I had seen countless times on the television in Hong Kong and my heart skipped a beat. What if I had caught it? What if they had to quarantine me and I would be stuck in a hospital in Asia with some contagious disease? I thought back to the machines scanning people’s temperature each time we crossed the border from Hong Kong to China, feeling uneasy with the prospect of being pulled aside and carted off to be further isolated. I ached to breathe deeply but such a task was impossible. It was 3am, I laid back down and focused on drawing air in slowly. I had another two weeks in China before I was scheduled to return to the USA, I would see how I felt in the morning and make the call from there. As fate would have it, I would not see those additional two weeks in China; the following day I could hardly control my coughing fits as I dialed the office and told them I would be flying back that day. We rebooked my flight, I packed up my little home away from home and stepped outside the Cosmopolitan hotel to catch a cab. Almost immediately my hand flew to cover my mouth as another fit of coughing overwhelmed me. As I breathed in I felt as though I was sucking on the back of an exhaust pipe. The air was hazy today, heavy with pollution, but similar to many I had experienced while living here, I simply assumed I had caught some sort of cold or something and needed to rest; or I had TB. Upon arrival back in the States I went straight to my doctor and was told that I had an infection and should take antibiotics. Three weeks later, the cough had not retreated, so I was again prescribed more antibiotics. After six weeks, fearing my white blood cell count was taking an incredible hit, I stopped taking the antibiotics and called a lung specialist in Philadelphia. While the violent coughing fits I had experienced in Hong Kong were more subdued, I was still struggling with a loose cough in my chest revisiting me every evening; something didn’t feel right. After a series of tests, I was informed that I had developed chronic obstructive pulmonary disease as a result of the poor air quality and extensive pollution exposure. From now on, whenever I was exposed to heavy pollution or smoke, my lungs would become highly sensitive and agitated. There was no way to reverse the damage, but the doctor told me I could limit the discomfort and further damage by reducing my travels in heavily polluted areas and any direct exposure to smoke. I was prescribed an inhaler to use before I went outside in polluted areas and advised that I should wear masks from now on. It was literally as though the pollution of China had entered my lungs and taken up residency…and there was no way to evict. 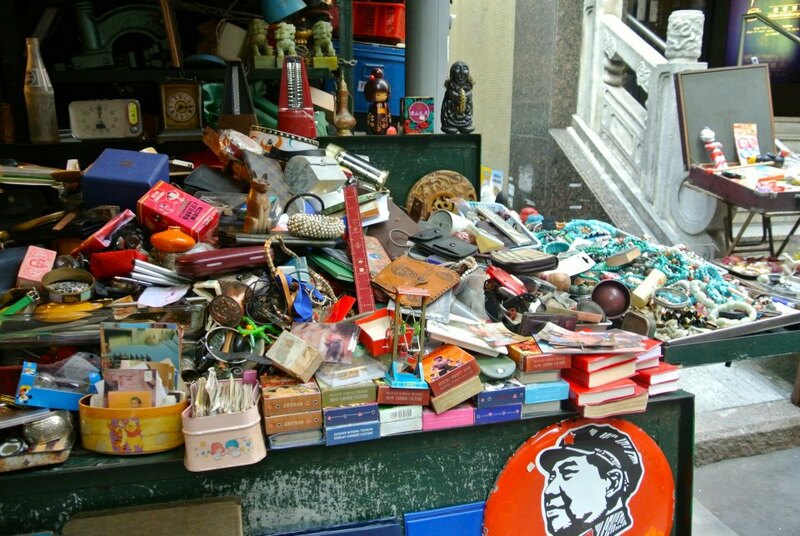 After confirming the diagnosis I continued to travel to Asia for work, pretty extensively. I wasn’t living there full time anymore so I could limit my exposure to some extent, and the inhaler and masks did help. Interestingly enough my role in my career transitioned from one of manufacturing management, to consulting on the human rights conditions of the workers in those factories. I had grown a personal awareness of the intensity of toxic fumes each time I stepped on a factory floor. 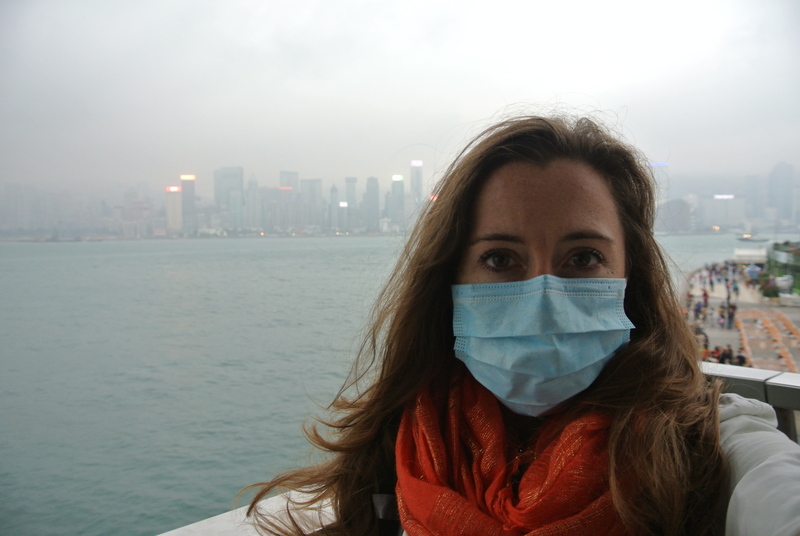 When I began to wear my masks every visit, I was not looked at as an outsider, in fact I blended right in (well, as much as a blondish/burnet western white girl can blend in Asia). Cruising the streets of Hong Kong and various cities throughout China, it’s not uncommon to see people wearing masks, actually it’s quite normal, which is strange when you consider it in a broader context. It’s estimated that in 2010, outdoor air pollution of China contributed to more than 1.2 million premature deaths in the country. I developed my condition in 2007; since then the citizens of countless Chinese cities have had to endure days of smog that were so dangerous schools and businesses were closed and people were advised to stay in their homes. As we continue to grow more aware of this critical issue, we dabble with the risky option of simply adapting to the self-inflicted degradation of our environment. I recently came across the latest fashionable “smog masks” that braced the runways at Fashion Week both in Paris and China. Seriously, check out the article in this link. Personally, I found this concept to be a bit grotesque… as it seems like a failure of my species to push the dial in the right direction. It felt to me like adaptation, like frogs sitting in a pot of water with the temperature set to boil, and no awareness of their impending doom. The presence of the masks at the runway show was interestingly timed, apparently being inspired by the Chinese marathoners who had recently donned pollution masks due to air quality concerns while completing the Beijing Marathon in October. It is a startling thing, to suddenly feel the impact of pollution, and to be immediately and aggressively affected by it. I can literally feel my lungs resist the air when I am in a smoggy city, or standing near people smoking cigarettes. This awareness has made me even more conscious of our impact on the environment, and how that directly impacts our own ability to continue living within it. If you’ve been wandering with me for a while (particularly via Instagram), you probably realize how much I love wild places. I adore trees. I feel my most alive when I am in nature, climbing trees or mountains, snowboarding down steep lines in fresh powder, sitting on a surfboard in the ocean watching a pod of dolphins surf the waves around me. Being outside, in the elements, ignites an awareness of living that I have never been able to experience when I have hit the streets of any man-made place. It is almost indescribable. The woods were my sanctuary when I lived in Hong Kong, they were my escape, my place to find relief for my exhausted lungs, a place to retreat and drink deeply the air that had been given back to me, refreshed with the breath of the trees. Having this condition has made me all the more aware of how essential wild places are when it comes to the quality of the air that we breathe in the long term. I’m not a fan of wearing masks when I travel. 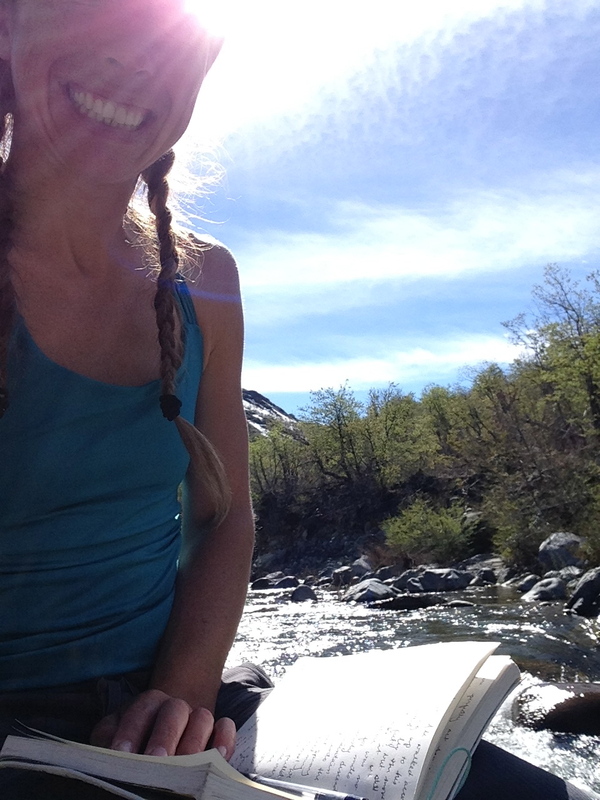 As you might have read in my previous post– I love to smile, and love the places that a simple smile has taken me. Behind a mask, it is much more difficult to connect with new people in a new place. You can’t help but feel incredibly separate from both the people and environment surrounding you. You are much more self conscious (particularly in those countries where masks are not yet “the norm”) and feel isolated. Recently I spent a week in Santiago, Chile. The first few days I was okay, as it had recently rained, and I avoided wearing masks simply because I wanted to blend in and try to get a sense of the place from a more local perspective. But by the third day I had to find masks, fast. Ale and I spent a good part of the day running around the city from Pharmacia to Pharmacia trying to find N95 or N100 masks rather than the standard painters masks that all were offering. At the end of the day we finally found a box of N95 and much to the shock of the shop keeper bought the whole box (instead of the single one they were used to selling). Here in Chile it is still not the norm, despite the poor air quality in many of the cities. For me though, it is too late for this to simply be a choice. As I experienced during a recent trip to several European cities that had me coughing for weeks, my condition is only going to be heightened as time goes on, so masks must become a constant companion each time I visit a developed or developing place. I know plenty of people who have spent years in these places and do not (noticeably) suffer from my condition. I share this story, these thoughts, simply because I want us all to take pause and think about what we are doing to ourselves, to one another, to the generations that will follow us (the generations born from us). When I lived in the smog, I adapted; at the time I was not motivated to push for change, to advocate for an alternative way of living. Those around me had accepted it as the “norm” and I simply learned to live with it. My perspective now, looking back, is quite different. If I could do things differently in this case, man I would have. 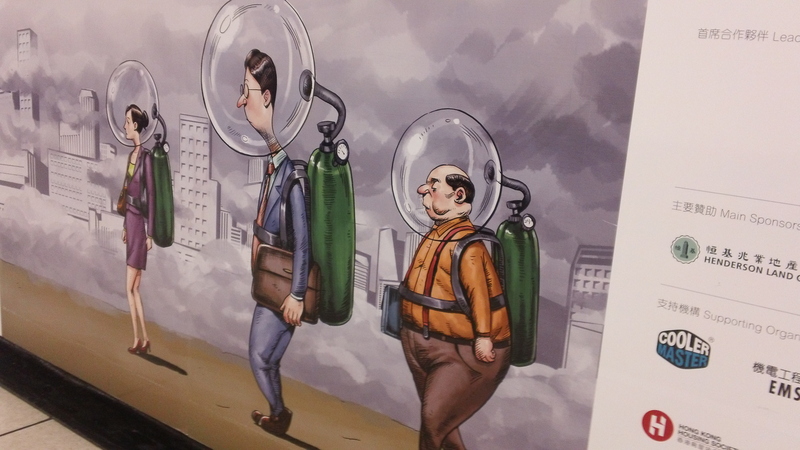 I would have done everything in my power to keep my precious lungs protected as I ventured off to build my career. Had I only known. Personally, I do not see the development of better, more functional and fashionable masks as progress, even though those things will benefit me as I continue to run around cities of the world. I see progress when I see forests saved and placed into conservation; I see progress in restoring deforested areas, when I find living walls and alternative production methods being used that emit zero air emissions. I see progress when I see effort to change what we know to be broken. I’m still finding my way, trying to understand my role in being a part of this change, leading an effort or supporting one that is far greater than myself. But I know I am meant to take this course, I know this is a cause worth raising my voice for, I know there is so much opportunity for us to turn our creative minds toward solutions that stop the damage rather than simply covering it up with another trendy product. For now, I’ve got a box of masks in my bag, no matter the destination airport. But when I escape to the wilderness, I am leaving those babies at home. If you would like to learn more about the air pollution issues in China and the health impacts of smog exposure, please watch the incredibly powerful and personal documentary recently released by Chai Jing entitled Under the Dome. This is not a fashion statement. This is me, running between meetings during my last work trip to Hong Kong/China. My masks are a constant travel must and have been for the past 8 years, as you can see the smog was pretty bad when I snapped this shot. My heart is pounding rapidly and feels as though it has been pushed up into my throat. I look down and realize I am gripping the sides of my seat, my entire body tense. I look to my left and see a wide grin across Ale’s face. Suddenly I acknowledge what I am doing, the fear and worry of the future having pulled me from this present moment and instead distracted me with awful “what-ifs”. I decide to let go of those what-ifs and simply enjoy the ride, I let out a laugh with Ale and encouraged our trusty little Subaru we endearingly refer to as Super Burro forward through the thick mud and rocky uneven road. What’s the worst that can happen? Well I don’t want to spend to much more time imagining that, so instead I begin thinking, what’s the best that can happen, even if something bad happens? “You can do this Super Burro!” I yell and laugh. 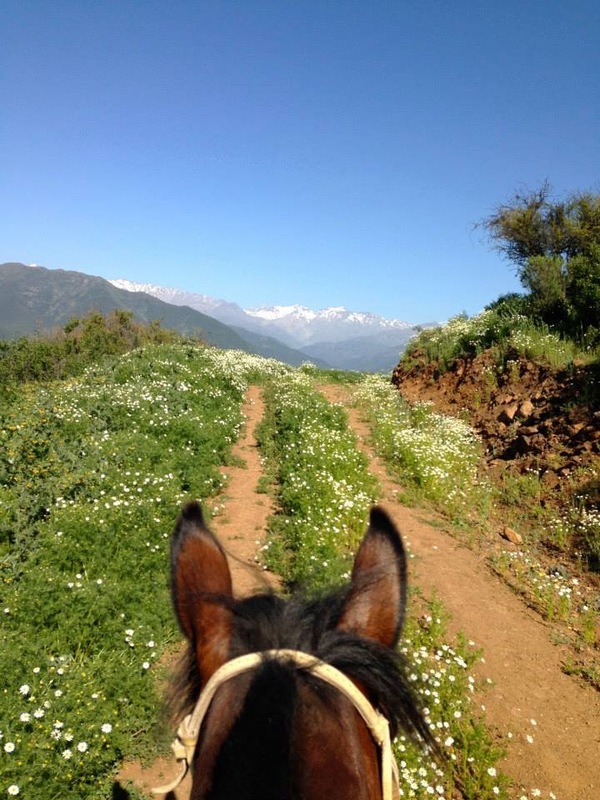 Just as suddenly as my attitude changes so does our progress- suddenly it becomes quiet as the car drops down and we are no longer powering forward and instead sit hopelessly stuck somewhere along the back roads of Chile. Ale and I look at each other as he again presses on the gas and we only feel the wheels spin- “Oh no…” we both say with wide eyes. This could be a moment to again entertain those “what’s the worst that can happen” scenarios, we are, after all, in a pretty dire situation. We are miles from the nearest paved road and similarly miles from any other route that has anything remotely related to “traffic”. I step out of the car and my foot sinks up to my ankle in mud. Immediately I fear the entire car may be swallowed up within the hour. We don’t have any cell phone service, but even if we did who would we call? We are in the middle of nowhere surrounded by fields, mud and tropical sounding birds. The road we are on, like many we have traversed since arriving in Chile, bears no name, and any description would not likely bring help. What would we say, “Yes, so you turn left off the main road onto a dirt road, the dirt road takes you back through the fields and rapidly deteriorates, eventually bringing you down steep rocky hills and when the dirt turns quickly into mud before you even realize it, yes that is where you will find us.”? Not likely to garner a rescue. Ale tries tirelessly to place boards beneath the tires and better position us so that we have some sort of traction. After hours of effort and little progress, we decide it is best for him to go look for help. Perhaps we’ll find a tractor in the field, or a friend along the road who can call another friend with a truck. I stay with the car and smile, thinking well, we certainly will have a story coming from this one…hopefully it’s a good one. Those “worst that can happen” scenarios fall quiet. I sit, I write, I listen to the sounds of the forest surrounding me. The sun is incredibly warm and I am so very thankful it is not pouring down rain on us. I find a log that makes a great seat, away from the wet mud, and listen to the birds, their exotic calls taking me to tropical escapes. I imagine the luck Ale will have in finding help, in somehow managing to get us out of this mess. I wander further down the road a bit, trying to see if I can hear or see any sign of life without straying too far from our stranded steed. 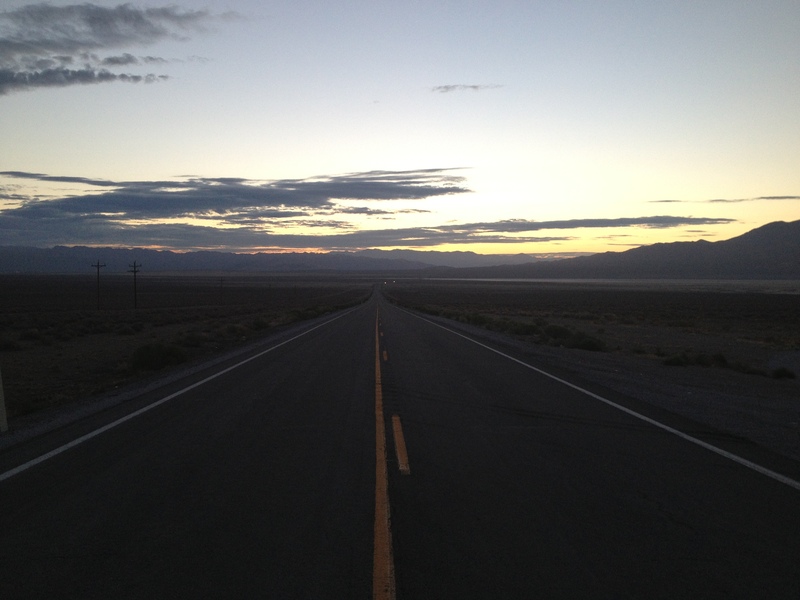 I try not to look at the road ahead, the deep pool of water and mud menacingly embracing the front end of our car. Deep breath, we are going to get out of this, and it’s going to be a good story, not a bad one. A few hours later I hear the sound of a harness and clinking of a chain. I can hear Ale’s voice, and the constant prodding of heavy feet in the mud. I run up to the edge of the hill to find three dogs, Ale, an old man who must be close to 90 years old and two oxen. Oh boy I think….here comes that story I was hoping for. Don Fernando has arrived, a local farmer who lives far down the road we had traveled. Ale had found him out with his oxen and asked if they might be able to pull us free from the mud. I can’t imagine how this is actually going to work, and I notice the oxen are staring at Super Burro with wide eyes, it seems as though they are thinking the same thing. We hitch the oxen to the back end of the car with the heavy chain attached to the yoke. Ale gets in the car, turns it on and puts it in reverse, hoping to help these massive beasts as they pull. I stand in awe and watch as the oxen pull, encouraged by Don Fernando’s feeble yelps and the barking of the dogs. My heart is again in my throat as I watch the wheels spin hopelessly and the mud is churned deeper. We try again, and still the weight and strength of the oxen is simply not enough to release Super Burro from the muddy depths of the road. Nervous butterflies tickle my stomach as I wonder again how we’re ever getting out of this. 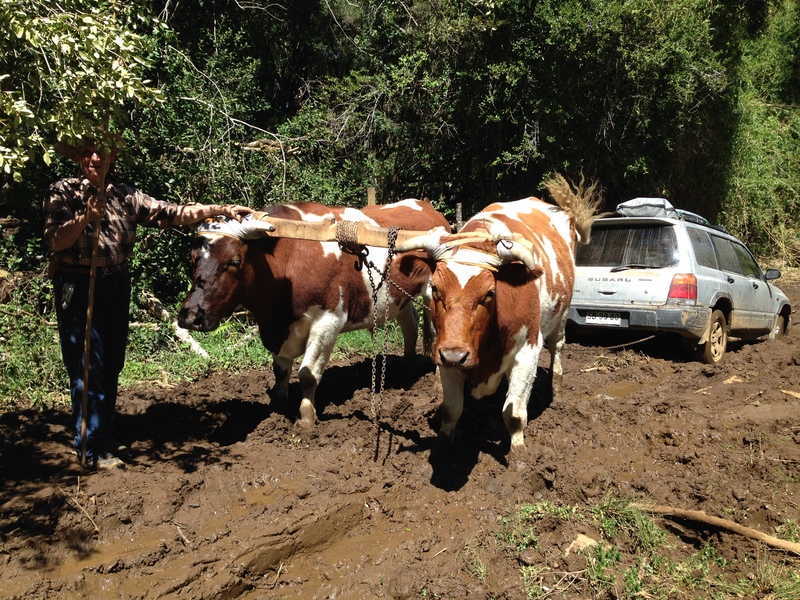 Eventually Don Fernando takes his trusty oxen home, he is old and very tired and the car simply seems too stuck. Perhaps a tractor will be better, he suggests, although he says that none of his neighbors have cars, so we must find a way to get to the nearest town. With a kiss Ale is again off, taking on the miles needed to meet the paved road in the hopes that he can hitch a ride into town and convince someone to get back here with a tractor. I am again alone in the woods with the sun and the birds. Again alone with my thoughts and imagination. The sun is dropping as the afternoon wears on. Hours pass before I hear voices in the distance and the sound of a motor. Gleefully I jump up and run to see who our rescuer is now. Ale is coming down the mountain, his gators caked in mud. Behind him I see a large red 4×4 pickup truck parked at the top of the hill. A man is standing on top of a rock peering down nervously. He is wearing a large brimmed leather hat, a button down plaid shirt, a pair of khaki pants and white socks with leather sandals. I can hear the uncertainty in his voice as he yells rapid fire Spanish to Ale. This is Don Luis. As he hooks his truck up to the back end of our car, Don Luis alternates between an attitude of unwillingness to that of overzealous belief in his ability to get us out. He yells loudly for Ale to step on the gas as he slams on his, the truck jerking forward before being jolted to the sides, sliding back and forth in the mud. We try, try again, and for a moment we see the small light of progress as the front end slightly emerges from the deep mud. Suddenly Don Luis and Ale are speaking fast in Spanish, the words jumble in my ears as I work strenuously to decipher what is happening. He doesn’t pull forward any longer, instead he gets out of his truck and nervously looks at his phone, trying to find a signal. He steps delicately around the blocks of mud, careful not to get his white socks browned, hiking up the hill and leaving us with both cars. I look at Ale questioningly, “He’s stuck,” Ale informs me matter-of-factly. At this point I can’t help but laugh. Oh boy! What are we going to do!? I seriously cannot imagine a possible solution, as I look up the road, back the way we came, where Don Luis has now churned the thick mud into deep, cavernous ruts. I look at the two cars, back to back, both stuck in the deep mud, well beyond our capacity to remove them in our current state. The sun has dropped and I can feel the temperature cooling. I grab a sweater from the car and realize it is 6:30. An hour and a half of daylight left, it looks as though we might be sleeping here. Eventually Don Luis returns. He has called his friend who has a pair of oxen, they will come to pull us out. I look doubtfully at Ale, remembering the lack of progress we had with Don Fernando’s team, wondering how they will actually be able to pull out this massive truck now as well. But I am advised that this is a younger team and a younger farmer, so they will be stronger. This is how it works here, I am told, you need the oxen, a truck or tractor will never work. We spend the next hour or so speaking with Don Luis, learning his story, hearing about his family, his farm, his parcels of land and simple little store where Ale had collected him. He speaks no English, and gets a kick out of the fact that I am American, and that I have been here sitting with the car all day. He asks if I was afraid to be out here alone, of strangers that could come around with ill intentions. I make a joke which Ale translates, something to the extent of being more afraid of strangers in cities than those I encounter out in the woods. He looks at the sky and says we should leave the woods though before it gets dark, since the pumas will arrive then. He seems only half joking now. Soon enough we again hear the clinking of chains hanging against the yoke of another pair of oxen. I look up the path hopefully and see a younger looking farmer with work boots and thick clothes, carrying a long pole and clicking to his team of oxen. This is Don Pepe. I don’t want to believe it but the pair of oxen he has brought are significantly smaller than those of Don Fernando… oh how on earth are we going to get out of this!? He first hooks the oxen up to the front end of the truck. The oxen bow their heads, ready to pull, Don Pepe lets out a shrill “Owwyeeeee!” and the oxen power forward. In the same moment Don Luis hits the gas and his truck miraculously lurches forward. He is free!!! The oxen had done it! They continue to pull him further up the muddy hill, as he zig zags and weaves he again forms new ruts in the soft earth, but I don’t care now, I believe that this can be done, and these two oxen can do it! Once Don Luis is back up the hill he parks the truck and runs down to us. We have hooked up the oxen to our car and Ale sits ready on the gas. With rapid clicking, numerous yelps of “Owwyeeeee!” the oxen pull, but again the wheels only spin, mud kicking up and splattering the edges but no lurches of freedom can be realized. We all look at one another, the evening darkness rapidly approaching. It is quickly decided we must leave the car for the night and come back in the morning with a winch that will make the power of the oxen stronger. With that, Don Pepe believes we will be able to move the car. Don Luis invites us to his home for the evening, also inviting Don Pepe to come by for a drink once he has returned his oxen to their field. 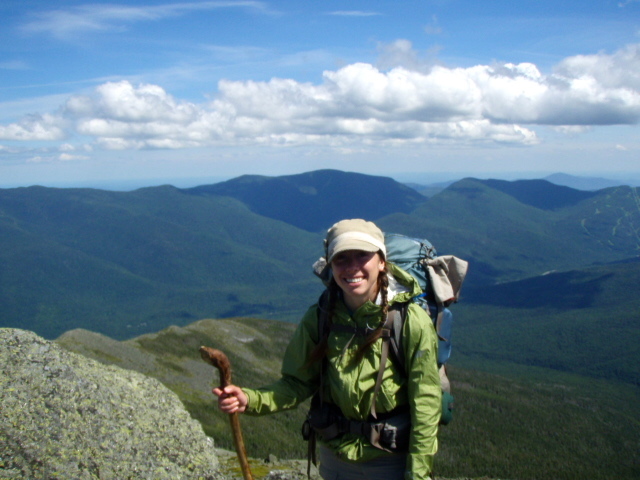 I smile as I quickly stuff overnight clothes in a backpack, wondering where this little twist of fate is taking us, and who these characters are whose lives have intertwined with ours. We spend the night in the very simple and gracious home of Don Luis and his wife, telling stories and laughing well passed midnight. A dinner of bread and cheese is presented, and Don Luis excitedly remarks to his wife to “mira la niña en la cocina” after I take up his offer to cook some eggs gathered from the chickens out back. 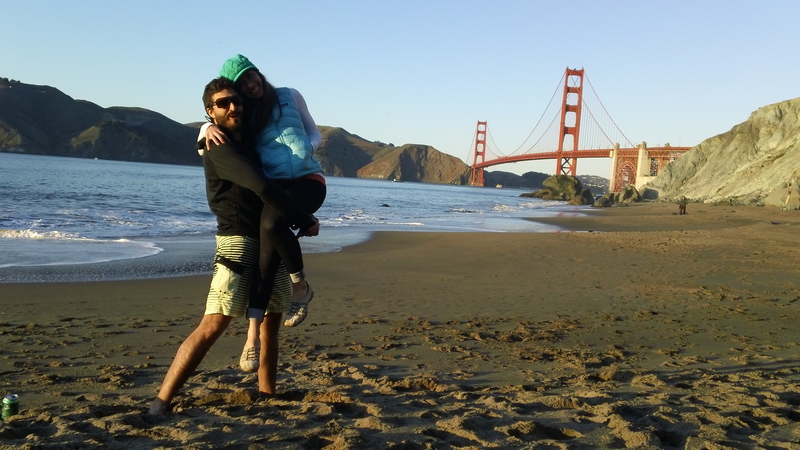 We share rum and beer and my broken Spanish mixes with their low-toned Chilean Spanish, Ale often lending an ear to try to translate, although even for him there are words used in Chile that are foreign. By the end of the night they are referring to me as “hija”, or daughter, and making us promise, with tears in their eyes, that every time we drive this way we stop by and stay, because we are family now. Oh what a moment, oh what a time, and oh how significant it felt that our paths had crossed in the moment and manner in which they did. The next morning Don Pepe arrives bright and early, as promised. We rush through breakfast, grab our bag and run outside to jump in his truck, finding the truck bed full of men from the small village. Don Pepe’s father sits in the front of the truck, his grey hair neatly tucked under a clean blond hat, his presence stately compared to the rag-tag team in the back. We proceeded to drive down a few dirt side streets, collecting two more men along the way. It literally felt as though we were bringing half the village to get us out. Driving through pastures, we eventually come to the field where the oxen sit grazing. What peculiar site we must have been, walking down that dirt road, 7 men from the town, the old father of Don Pepe walking with his cane, Ale chatting with Don Pepe alongside the trusty oxen and me, the only woman among us. As we arrive to the hill, we look down and see Super Burro still sitting where we left it the night before. A little part of me seriously believed it would be swallowed up in the sinking mud, so I let out a quiet breath of relief. We again connect the oxen to the back of the car with the same chain, but this time also connect it to a winch that the men tie to the tree. Ale revs the gas and the oxen begin to pull as Don Pepe lets out another shrill “Owwyeeeee”! My heart is racing now, the anticipation and hope that this works feels simply palpable. Nothing. The car does not budge. My heart feels as though it drops down to my stomach…now what? The men have gathered around the car, all of them bracing the front and the sides. They are all yelling to one another as Don Pepe readies the oxen once more. Ale steps on the gas, a loud “Owwyeeeee!” mixes with the calls of the pushing men and with a sudden jolt Super Burro is free from the muddy pit and is being pulled backwards with great force. Everyone stops and cheers. 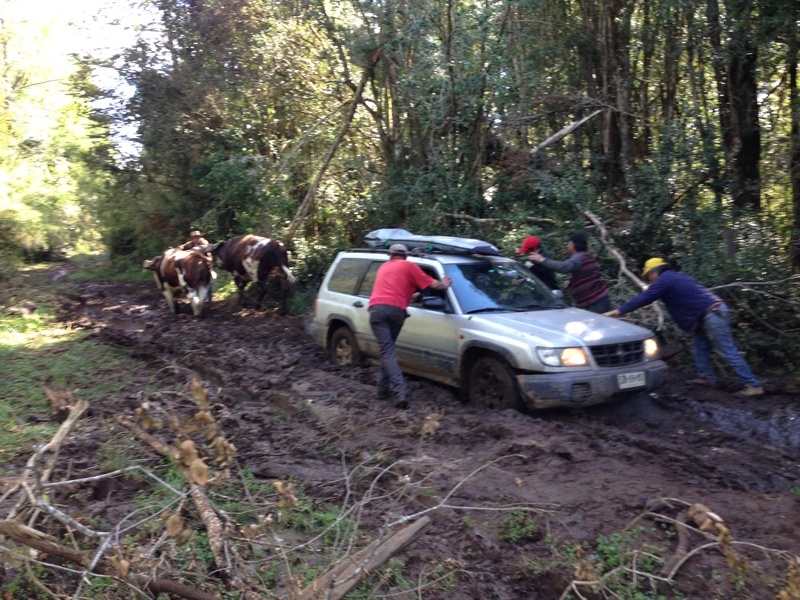 The winch is removed and the oxen pull Super Burro up the hill, easily towing the car across the deep ruts made by Don Luis the day before. It is truly an incredible site…the sheer strength of the animals is simply shocking and their power is obvious. Finally our little steed is free. At the top of the hill Ale is able to back up and turn the car around. He slowly drives forward as the rest of us walk behind, ensuring there are no future problems with some of the ruts further on. There is a relieved energy that resonates among all of us. Once we are beyond the deep mud and back on solid stones, we say farewell to the men and the oxen. There is no request for money, there is no demand of anything, only well wishes on our journey and some laughter with advice to stick to actual “roads” in the future. I give everyone a hug, my heart fit to burst with gratitude for their time and energy and selfless willingness to help us in our moment of need. We stop by Don Fernando’s house on the way out to show him our liberated Super Burro, he smiles a wide toothless smile and nods and laughs, hugging me as we bid farewell. What a funny way to embrace a disaster. At the end of the day, it was a grand adventure. Although getting the car stuck was one of my original “worst that can happen” scenarios, the people, the stories, the heartfelt gratitude and laughter were all elements of my “best that can happen” scenarios. And that acknowledgement made all the difference. Oh what fun these little twists of fate can be when we simply decide to smile and laugh no matter what! Have you ever been on the brink of disaster and chosen instead to imagine the positive that could come from being in a bad spot? I bet the chance will arise at any moment….so don’t forget, worrying about the negative possibilities only takes you away from experiencing the present moment, and if you lean into that moment, even when bad things happen there is always opportunity for beauty and laughter to grow out of it. And maybe, if you’re lucky, you will find the kindness of strangers ready to embrace you, no matter how hopeless your state may seem. 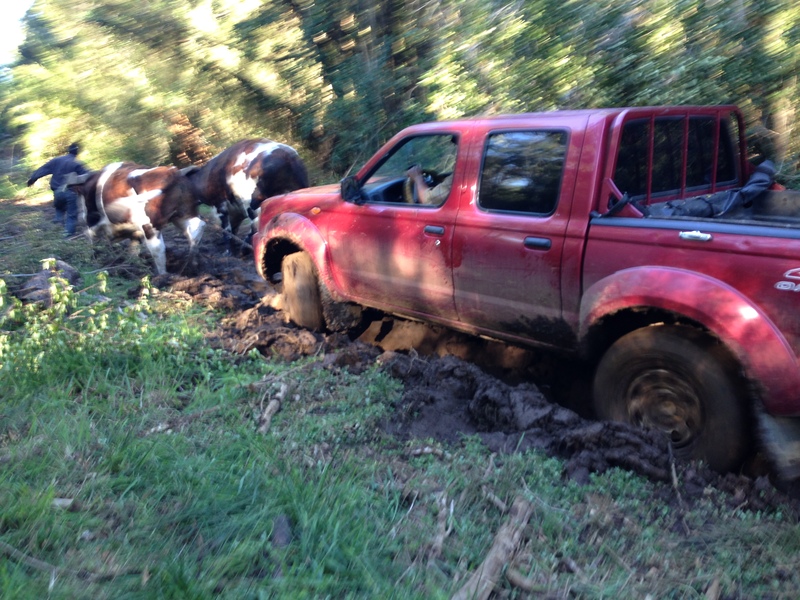 Super Burro is finally free thanks to our new friends, a winch and some incredibly powerful oxen!